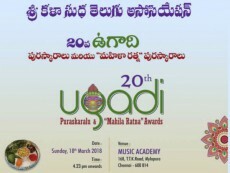 Sri Kala Sudha Telugu Association cordially invites you to the 20th UGADI PURASKARALU AND MAHILA RATHNA AWARDS. Venue : Music Academy, 168 TTK Road, Chennai Date : Sunday, 18th March 2018. Time: 4.23 Pm onwards (with high tea) Please come, dont miss.